Samsung launched next generation Tizen smartphone Samsung Z2 on August 29 and from that day it is trending in competitive market. With the price rate Rs. 4590 many customers prefer it for their first 4G smartphone. Over that Reliance Jio in India providing free unlimited voice & data for 90 days to every Z2 users. So for the first time buyers it is bonus to get many bundle offers with their first smartphone. For the many customers Samsung Z2 is their first smartphone so obviously they are new to Tizen operating system. In the everyday use many new customers are facing some problems on Tizen. Update: Now Samsung has new player from its side into the Tizen market, i. e. Samsung Z4. It is mid range smartphone to the basic users with the affordable price. It will suppose to launch in some African and European countries. If you have bought this phone and want to download some amazing games and apps then follow below steps. Of course, it happens to every new users when they switch to other platform. I got many E-Mails from some new customers about how they are facing problems on Tizen. To help those users I decided to post some simple notes on our website where I will share articles about how to use Tizen in simple way. In the start I will guide you on how to download free apps from Tizen Store. I chose this topic because many new users are enable to download apps from Tizen Store. We know how much apps and games are mean to any smartphone users. Everyone wants to use basic or needy apps on their device, either they are personal apps, social media apps or quality games to make them happy. If you also having problem during downloading apps from the Tizen Store then follow these simple steps to download them successfully. 1. 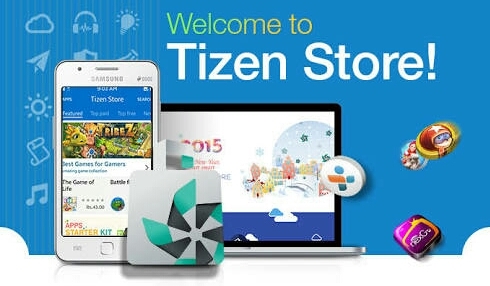 Open Tizen Store to download any apps or games. 2. Select your favorite app to download and tap on Get button. 3. After that it will ask you to login to Tizen Store by using Samsung Account. 4. Don’t have Samsung account? Then Sign Up to smartphone with Samsung account. Or go to Samsung website and sign up to their account. You can also use your Samsung phone account when you created on Android device. If you already have Samsung account then you can directly login to Samsung account, and if you don’t have Samsung account then first create it with your current email ID. Note: Many users always try to login with their Google or Android account which is not possible on Tizen. This is Tizen OS not Android so you have to create new Samsung account. Yes, you can create Samsung account by using your Gmail ID or Microsoft ID. 5. That’s it, after successful login, app will automatically start to download on your device. Just follow these simple steps and you will get your favorite apps on the device. Note that to get paid apps you have to provide some more information at the downloading time. To make these steps simple I hadn’t added those steps here. If you want to buy paid apps or games from Tizen store then I will guide you in our next article. Now go to the Tizen Store and install some quality apps on your Tizen smartphone. Don’t forget to share this information with your other Tizen friends. I have an app in which i put one background image and one text view on that backgroung. So, i want to merge both view and make png image which user can download. give me hoststar link plz…. How can i download Snapchat? Right now, Snapchat is not available in Tizen Store. I will inform you when it comes. You can raise your complaint at Samsung.tizenforum.com. It is Official forum for Tizen users. You can sign up to Samsung or Tizen Store with your current email ID like Gmail or yahoo etc. Tell me what exact problem are you having? Is there any issue when downloading? Create new login ID with your email ID. How can i download and install jw library app? Chrome or imo or olx kaise download kare…Tizan Z2 mein..
Third party apps are not allowed on Tizen. You can download apps from Tizen Store. Please I want jw library for my tizen device. Till to date those apps are not present on Tizen. Instead you can use alternative apps. TIZEN FONE ME KYA KOI VIDEO CALLING APP DOWNLOAD HO SAKTI HAI KYA? AGAR KOI BHI VIDEO APP HAI TO PLZ SHARE WITH ME. Zipt Messenger is available in Tizen Store. It is not present on Tizen. i stay in zimbabwe i created samsung account but still cant download because the service is not available here. what can i do? Both are not available in Store at this moment, but soon we could get it. It happens due to low internet connection. Use proper internet network or Wi-Fi connection. If still problem persist then check your login ID and password. before time of downloading it shows for wi-fi network always. why it cannot use mobile data to download? or is there any setting that i have to do to download app by my own mobile data? still its hectic and this makes me worry because it is so expensive and with less apps and why can’t it receive app from flash share of other smartphones…….